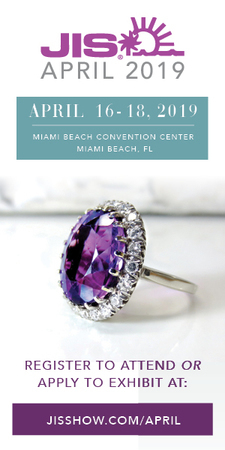 JIS April 2019 is a unique and intimate trade-only jewelry show taking place in Miami Beach, Florida, April 16 - April 18, 2019. Referred to as “The Niche” show, the JIS April Jewelry Show was originally established to support the buying needs of Latin America’s Mother’s Day season. Not only is the timing ideal for Mother’s Day inventory purchasing, but it is timed perfectly for Father’s Day, Graduation celebrations, Wedding season, and summer tourism for Latin America, the Caribbean, the United States, and beyond. With three (3) full days to buy and sell, JIS April offers just-in-time delivery with both factory order writing and at-show delivery permitted. For 2019, the show will take place Tuesday, April 16 - Thursday, April 18. To register to attend or apply to exhibit, visit jisshow.com/april or call +1 (800) 840-5612.